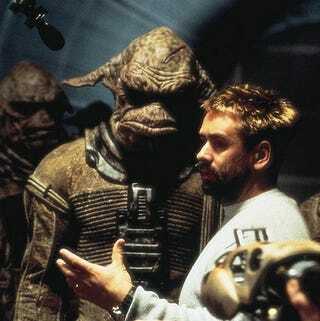 It's about time Luc Besson got back into the scifi business. The director is wagering that his next scifi project will be even bigger than his cult classic The Fifth Element. And we think we know what it is. "When I did The Fifth Element, I already had the technological tools that were a little outdated. With the advent of digital technology, it is amazing what you can do. The technique has caught the imagination. One can imagine anything, there will always technicians to follow you in your delusion. " Right now the project is in the "creature design stage" but he promises that the film will be "big, very big." We wonder if the mysterious space prison film he's been kicking around for the last few years. It would be about a space prison in orbit around Earth, which houses 500 of the world's most dangerous criminals. Naturally, there's a jailbreak. Though last we heard Besson was merely involved as a producer on the prison project, not the director. Maybe that's changed? Luc Besson Spurs Another Futuristic Jailbreak. But Will There Be Parkour In Space? Besson was also a producer on District 13: Ultimatum, which he hoped to remake in English.